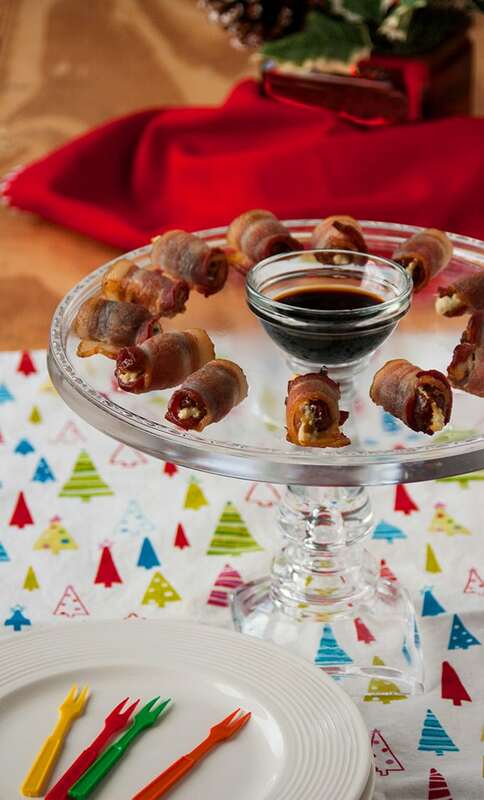 Gorgonzola-Stuffed Dates Wrapped in Bacon are delicious plain or dipped in soy sauce! Gluten free. I’m officially an appetizer freak. Especially when there’s cheese involved. Add bacon, and I’m a goner. When I heard that cheese-stuffed, bacon-wrapped dates are a thing (did you know? ), I had to get in on the action. After all, Date-Nut Cream Cheese Bites have been a family tradition for decades. Why not explore other variations? 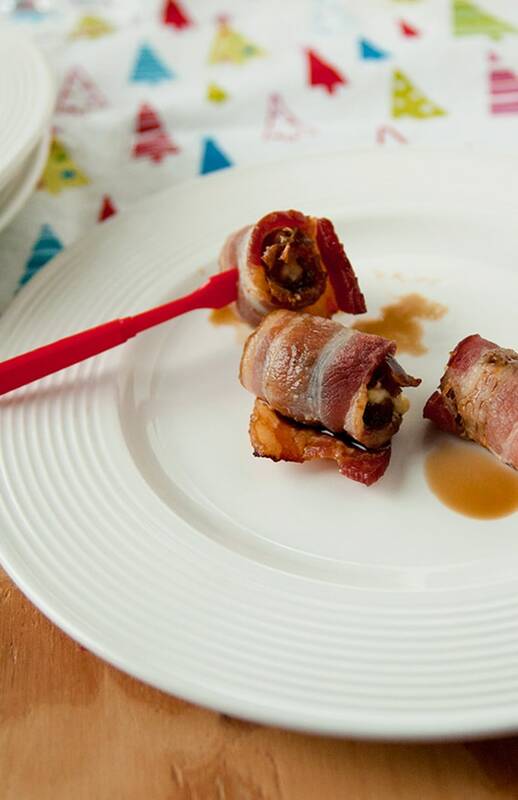 So, I baked Gorgonzola-stuffed dates wrapped in bacon…and dipped them in soy sauce for the umami win. Yes! With all the planned and last-minute gatherings happening this holiday season (yay! ), I’m glad to have another fantastic appetizer in my collection of family-approved recipes. Plus, this one’s gluten free. Make sure to check out the rest of my appetizers if you need some ideas. Who needs dinner? 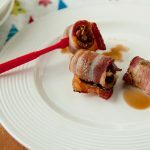 I’ll just stuff my face with these Gorgonzola-stuffed dates wrapped in bacon! If I don’t catch you again before Christmas, Buon Natale and Happy Hanukkah to those who celebrate! I wish you love, peace and joy. These dates are fun to make and eat! Use a knife to make a slit in each date, without cutting all the way through. Fill each date with about a teaspoon of gorgonzola, pressing it into place. Gently squeeze the date as if to close it, to make the filling more secure. To wrap: Horizontally place a gorgonzola-stuffed date on top of a vertical bacon strip, about an inch from the bottom. Bring the bottom edge of the bacon over the date and continue rolling securely. Place your wrapped dates, with the seam side down, on two ungreased, rimmed baking sheets. Bake the dates for 15-20 minutes, or until the bacon is cooked through. Transfer the dates to a paper-towel-lined platter to absorb some of the bacon grease. After a couple minutes, transfer the dates to your serving dish, provide toothpicks or mini-forks, and have soy sauce available for dipping. Oh my Yum-oooooooooooo!!! Hope you had a wonderful Christmas! Happy New Year! 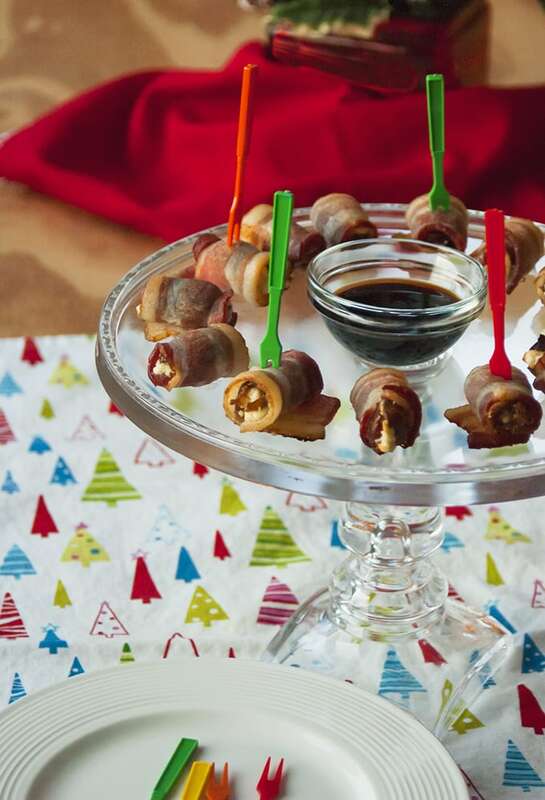 I love dates wrapped in bacon. That salty sweet flavor combo is just the best! I bet the gorgonzola adds such a nice depth of flavor to each bite. YUM. I love blue cheese with dates- add bacon for a nice package and we have a winner! Yeah, I don’t eat bacon often, but couldn’t resist these. It’s the holidays, right? Bacon and dates is such a great combo — and with gorgonzola — wow! That’s over the top! It’s a really delicious combination, Lisa! I love bacon wrapped anything and these look so good! I love dates! I love dates too! I keep them stocked in my pantry. Thanks, Elaine!